There’s a downhill mountain, or backcountry touring area, perfect for your New Hampshire skiing vacation in this article. Come join me – the skiing is great! Or schussing down gentler slopes to enjoy the scenery – it’s here. Or touring away from the crowds – well, it’s here as well. And if you’re looking for New Hampshire skiing for the family, then you’ll find mountain areas tailor-made for you, with kids schools and snow tubing parks. New Hampshire is a paradise for skiers. And getting to the ski areas is quick and simple from major arrival cities in southern New England. The state really stays on top of keeping the roads plowed and cleared – because New Hampshire skiing is big business for the state. Northern New Hampshire Skiing: Black Mountain, Bretton Woods, Cannon Mountain, The Balsams, and Wildcat. Most of the high peaks for New Hampshire skiing are in the White Mountains in the northern region. You’ll find snowboarders welcome at most of the resorts listed here. This is a popular and rapidly growing snow sport – and big business for the resorts. And you’ll also find snow tubing parks, especially at the more family focused areas. Some are only open at the weekends, so be sure to check before you head out for your day of slippery fun! Pats Peak really focuses as a family destination and is particularly well equipped for those still learning to “stay upright” and learning the sport. I was introduced to downhill skiing at Pat’s Peak 21 years ago, and it’s still going strong, and a popular ski resort for all skill levels. Snow Tubing is very popular here, and so reservations are recommended. Check their web site for hours of operation. Pats Peak has night skiing. 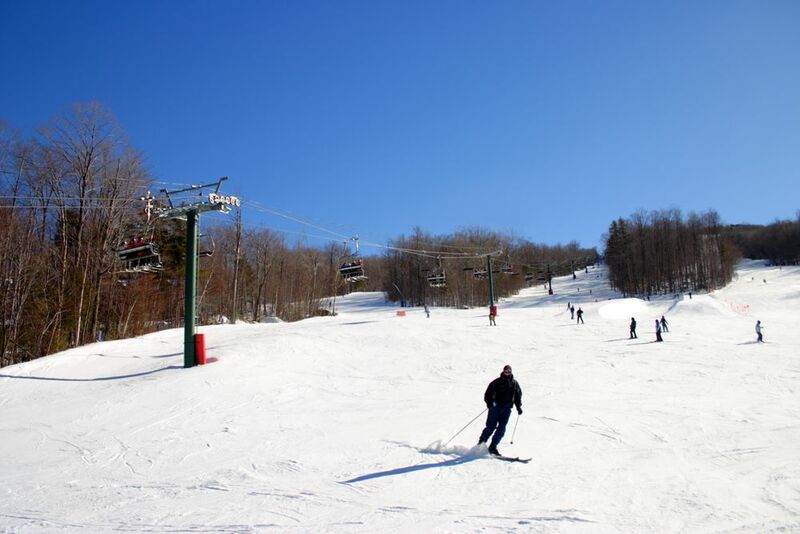 Mount Cranmore is another area that caters for the family and especially kids. When we visited it was mid-week and not a vacation period. One of my sons had a group lesson that turned out to be a 2-hour individual lesson – a great deal for him and me! I found the staff at MT. Cranmore very friendly and low key, especially with kids. Be sure to try out their tubing park. It’s only open at weekends but it’s got seven lanes, lighting, and the snowmaking capability keeps it operating in top condition. Great fun for all the family. Mount Cranmore only has night skiing on Saturday and select vacation periods. Attitash is two mountains – Attitash and Bear Peak. You can ski between the two or take a shuttle. Both mountains have gorgeous views from their summit areas. I found the trails more challenging when I skied than other mountains. But you’d expect that, as 75% of the trails are “more difficult” to “double black diamonds.” If you’re looking for a challenging New Hampshire skiing day then Attitash could be your paradise. I stayed at Attitash Mountain Village resort when I went. It’s a condo type village right at the base of the mountain. Heck, you can even walk to the chair lifts. Wildcat Mountain lies to the east of Mount Washington on route 16. On clear days, skiers at Wildcat enjoy a magnificent view of the Tuckerman and Huntington ravines on Mount Washington. The summit at Wildcat is 4,000 feet. And it has all types of skiing levels down from the top. Wildcat has a 4-passenger gondola to take you to the summit – not only a nice way to travel up the mountain, but something you can’t experience too often skiing in the Northeast. Like Attitash it’s got some real challenging trails. Bretton Woods is my favorite New Hampshire skiing area. The first time I skied there I felt I’d come home. It’s a classy mountain with a large amount of terrain, and a great lodge. The owners maintain it’s now the largest ski resort in New Hampshire. I remember lounging near the lodge fire after a great day’s skiing and it snowing outside. I just wanted to stay at Bretton so bad, but had to drive back to Boston after the end of a perfect New Hampshire skiing vacation day. Hey, we all have one of those tales don’t we? If the valley is clear you’ll have a great view of the Mount Washington Hotel while skiing. But don’t take your eyes off the trail for too long! At one time I used to do more cross country skiing than downhill. It’s not quite so demanding on the knees and it’s a great way to keep fit. New Hampshire has some excellent Nordic skiing terrain. However, most of it is up north. While snowmaking equipment is available on just about every New Hampshire skiing resort, for cross-country trails Mother Nature still has to supply the base goods. And the reality is that the further north you go, the more “natural” snow falls. And that’s what you need for great Nordic skiing. Some of the mountains I’ve already mentioned have cross-country skiing available. Namely Attitash and Bretton Woods. Waterville Valley also has touring trails but I haven’t done those yet. But if you’re in the area of North Conway then you must check out the Jackson Touring Center, in Jackson, NH. You’ll find miles of groomed trails of all abilities, as well as ungroomed trails for real touring. They also have snowshoeing trails. I don’t have my own XC equipment anymore so I always rent from the touring center. The trails go over open fields and so dress in layers. The Mount Washington area in winter can be real windy and bitterly cold. But once you get into the woods it’s gorgeous and calm. You just can’t get any closer to nature than skiing in the backcountry. But here you’ll discover why it may be worth a special trip to sample this type of skiing vacation. Hey, Look What They're Doing With The Cog! Up until 2004 if you wanted to ski Mount Washington then you waited until spring and did the “Tucks” thing – more on that later. But now you’ve got another option… and it’s pretty exciting and unique. The cog railway that runs up to the summit of Mount Washington is owned and operated by the same people that own the Bretton Woods ski area. And thanks to them you’ll be able take the cog railway up to a beginner and an intermediate trail. You’ll arrive at Marshfield base station and take the quick ride up to an elevation of 3,800 feet for the intermediate slope. Just imagine skiing down the slopes alongside the cog train as it returns to base. The wind on you face and the smell of steam and coal burning all around you. Now okay, maybe not the extreme skiing you’ll get at “tucks”, but you don’t have to wait until spring, and it’s still one of those once-in-a-lifetime experiences. And with the gentle slopes you’ll find the whole family can experience it. I just can’t do a page on New Hampshire skiing and not say anything about Tuckerman Ravine – or “Tucks” as it’s affectionately known. But it’s far from your average downhill skiing venue… as you’re going to find out. If you’ve already visited my special Mount Washington page then you know how special this mountain is to me. But there I don’t talk about skiing. The focus is on summer and fall activities. But winter and spring is a very different environment on Mount Washington. It’s a world of avalanches and bitter cold, and danger for the inexperienced hiker. In fact skiing in Tuckerman Ravine is only a spring event – most seasons March through May. In winter the threat of avalanches are too great. But if you want to ski Tuckerman, then you’d better be prepared to hike and expend some serious energy. You’re going to be carrying everything you need with you – ski equipment, food, and cold weather gear from Pinkham Notch visitor center. Pinkham Notch visitor center is on route 16, 15 miles north of North Conway. This is natural skiing with no grooming and no chair lifts or toe ropes. But if you’ve read this far then you guessed that anyway, right? Well, take another look at the picture of “The Bowl.” There’s nothing else like it in the Northeast. And the fact is when most resorts for New Hampshire skiing have closed their doors for the season… Mount Washington has just “opened” hers. And for extra benefit it’s FREE and there’s no lift lines! There are a few basics you should know. To ski this area you should be comfortable taking any trail on a regular lift-serviced area. This isn’t a place to let your ego show through or kid yourself about your skiing ability. You’ll be carrying everything you need for protection and skiing, and sustenance in (and out) with you, on your back. And you’ll be hiking for on average three hours before you do any skiing. Be prepared to hike the trail you ski so you know the terrain down. To get great information on what you’ll need on the mountain and how to better prepare for your trip check out the Tuckerman Checklist. You’ll find an interesting typographical map of the Tuckerman Ravine area. You’ll find lodging choices at many New Hampshire skiing areas, although they tend to get filled for the season quickly. But my preference is to stay in a central location near to my favorite ski mountains. North Conway is one of my favorites because it’s close to Bretton Woods and Wildcat, and many more ski areas. 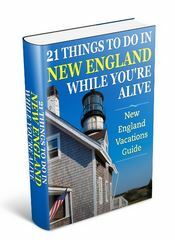 North Conway and New Hampshire has many great inns and bed and breakfasts to choose from. 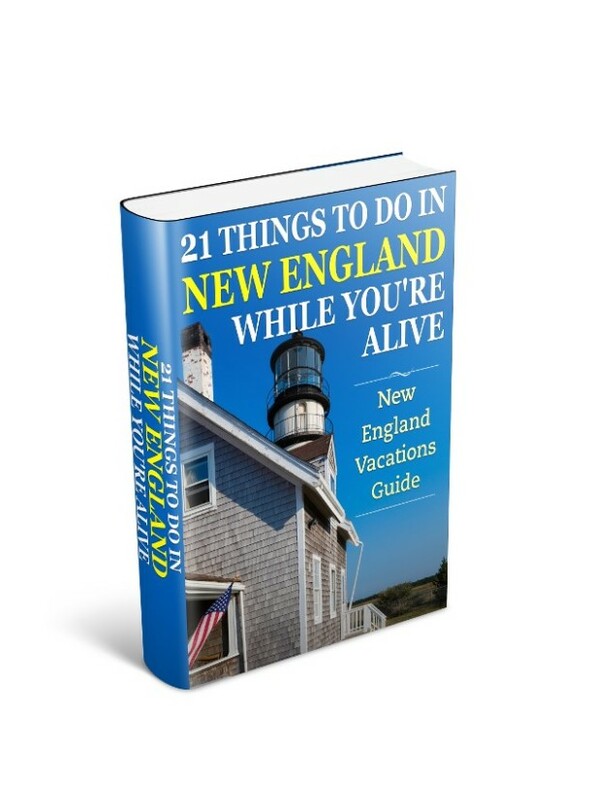 To discover where to stay deals, and compare rates and amenities with a trusted and professional travel organization then check out New Hampshire lodging and accommodations.